PORTLAND, Ore. (AP) — A driver rammed into three women walking on a sidewalk Friday in downtown Portland, critically injuring one of them, before speeding away and getting arrested within hours of the crash, authorities said. Greg Phillip Porter, 61, is being held at the Multnomah County jail on several counts, including three counts each of attempted murder and assault. 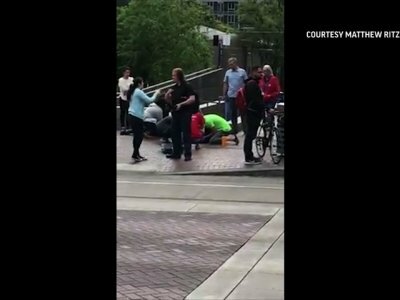 Someone called 911 after spotting a blue SUV that matched the description of the vehicle that struck the women near a light-rail station close to Portland State University, police Sgt. Pete Simpson said. Police have not yet determined a motive. Authorities said they were getting a search warrant to seize the car with a crumpled hood and have yet to rule out intoxication, mental health problems or a medical incident as the reason for the crash. Sgt. Chris Burley said one victim was in critical condition at a hospital and another was in serious condition. The family of the third woman asked that no updates be given about her health. Police have not said how fast the 2005 Mazda Tribute was traveling or how long it spent on the sidewalk before speeding off. Witness Christopher Bond said he was standing on the sidewalk when he saw the SUV hit at least two women. He estimated it was traveling about 45 mph (72 kph). Bond said he turned to help, and the driver “gunned it,” nearly hitting him. Kat Caputo was talking to a friend by the light-rail station when she heard a commotion and turned around. She saw two women lying on the sidewalk and another leaning against a brick wall. Others were shouting that a car had jumped the curb, struck the women and sped away. One of the women appeared to have serious back injuries, Caputo said. Police cordoned off several blocks around the crash. A green sweater, a pair of sneakers, a pink slipper and one black bike glove lay scattered on the sidewalk near a small splash of blood. The crash stunned the city on the Friday before Memorial Day. On that Friday last year, a passenger fatally stabbed two men and wounded a third on a light-rail train as it pulled into a station. Police said the passenger spewed hateful comments at two black teenage girls shortly before the attack. Associated Press photographer Don Ryan contributed to this report.